Argan is a long-lived (150-200 years) evergreen, thorny tree (Lamnauer, 2005). It is a medium-sized tree that reaches a height of 8-10 m, sometimes up to 20 m. Its strong root system can reach a depth of 35 m, making it able to survive droughts, and suitable for arid and semi-arid areas (Orwa et al., 2009). The trunk is knotty and has a diameter of up to 1 m. The tree bears many criss-crossed stems. The leaves are small, clustered and lanceolate (Wickens, 1995). They can absorb any moisture from the air (Lamnauer, 2005). The inflorescences are axillary borne. The flowers are bisexual, greenish-yellow in colour (Wickens, 1995). 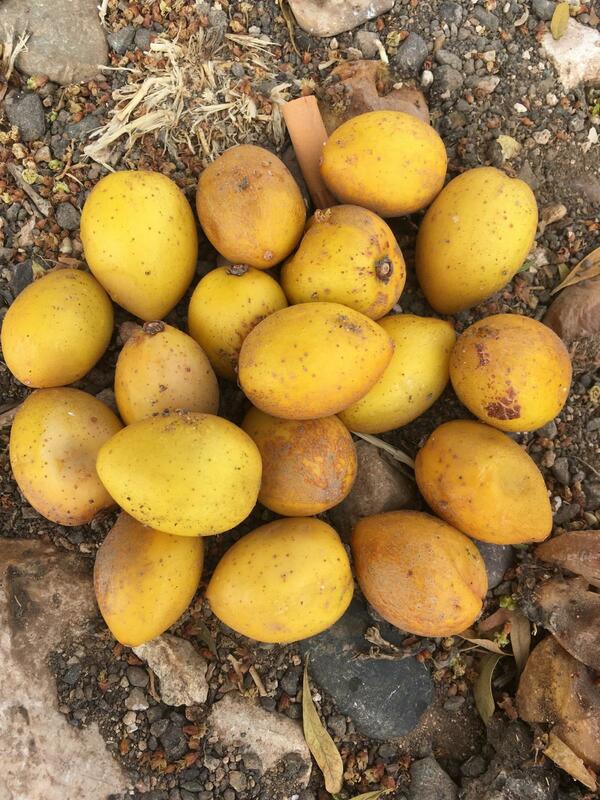 The fruits are ovoid fleshy drupes that can need 1 year to ripen. They are green to bright yellow in colour and their pulp contains a milky latex unpleasant for humans (Wickens, 1995). 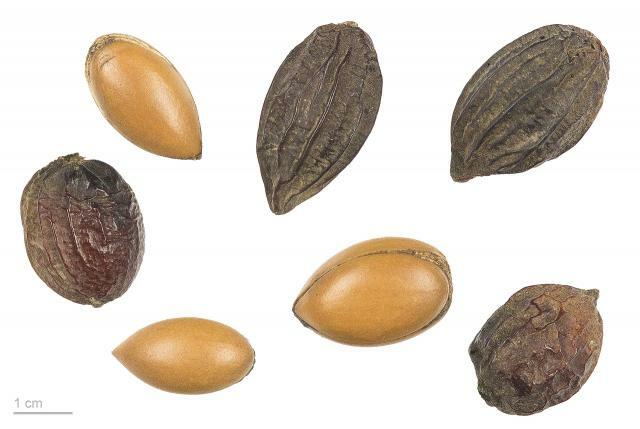 They are quite similar to olive fruits, but larger and rounder, and they may contain up to 3 seeds (Lamnauer, 2005). 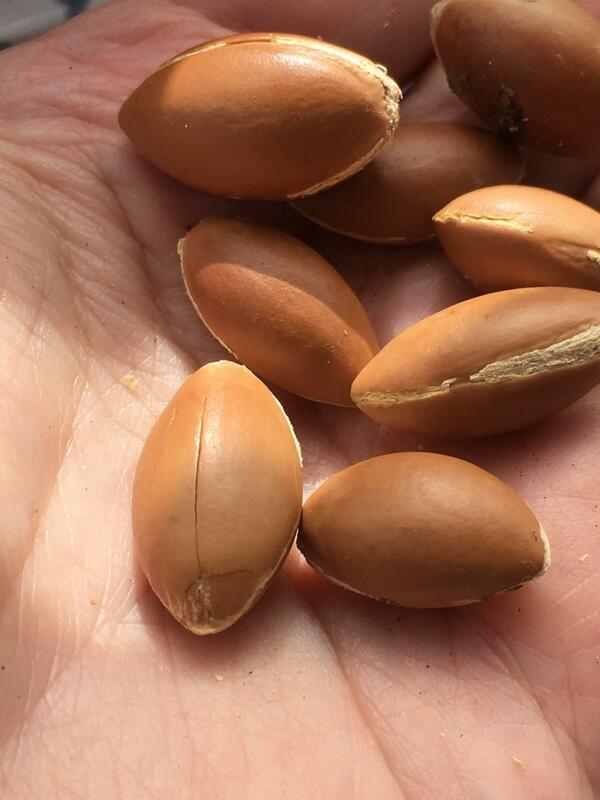 The argan seed is a hard-shelled nut containing 1-3 kernels and yielding 50% of edible oil (Orwa et al., 2009; Lamnauer, 2005; Wickens, 1995). Argan is an important economic resource for local populations in Morocco. It is primarily grown for its oil, which is edible and used in cooking, salads and couscous. Argan oil was imported into Europe during the 18th century but could not compete with olive oil due to its stronger flavour (Wickens, 1995). Argan oil has a valuable fatty acid profile, as it contains 80% polyunsaturated fatty acids, including 13% palmitic acid (C16:0), 48-59% oleic acid (C18:0) and 30-40% linoleic acid (C18:1)(Charrouf et al., 2009). It was reported to reduce harmful cholesterol and triglycerides (Charrouf et al., 2010). Argan oil contains large amounts of vitamin E (Wickens, 1995). Argan oil has cosmetic and dermatological properties, and is traditionally used to treat belly stretch marks, chicken pox pustules and acne (Orwa et al., 2009; Charrouf et al., 1998). Argan oil is used to make yellow soaps and hair and skin care products. Oil extraction residues can be mixed with sugar or honey to make a dip similar in taste to peanut butter (Orwa et al., 2009; Wickens, 1995). Argan wood is particularly resistant to insects and is much used for carpentry, construction and utensils. It provides firewood and charcoal. The nut shells are used as fuel for cooking (Orwa et al., 2009). The argan tree is a major source of forage for sheep, goats, camels and cattle in Morocco. The leaves can be lopped or directly browsed by livestock. Fruits and leaves are readily consumed by goats who climb on the trees to eat them. Argan fruits can be eaten by livestock without hampering oil production as the seeds are not digested and can be recovered in the dung. The press cake resulting from oil extraction is sun-dried and is fed to livestock (FAO, 2015). Bees nest in argan trees that are thus a good source of honey (Orwa et al., 2009). Argan is an endemic species from the arid regions of south-western Morocco, where it has been traditionally cultivated for centuries, and southern Algeria (Wickens, 1995; Merouane et al., 2014). Argan is found from sea level up to an altitude of 1500 m. It thrives in almost all kinds of soils, with a preference for sandy deposits and poor desert soils, and in places with no more than 100-500 mm annual rainfall provided there is no frost. Argan trees are thus ideal for arid climates. Argan is not suited to drifting sands and water-logged soils. Argan trees cling to the slopes of rough hills and seem to thrive between the rocks on poor soil or on marginal lands, sometimes with some salinity (Wickens, 1995). 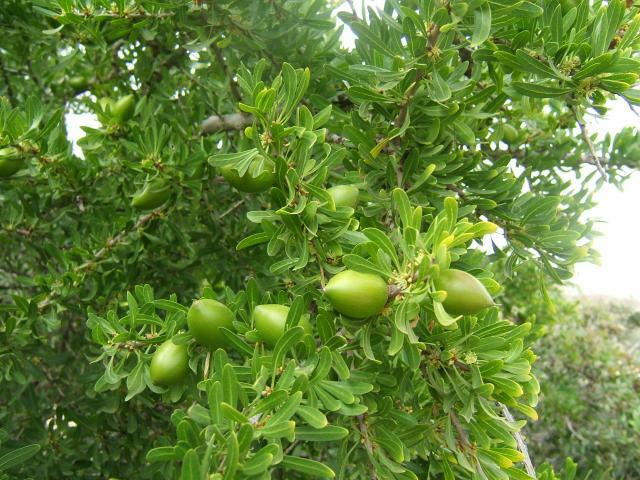 In 2013, argan trees occupied 830,000 ha in Morocco and produced 4000 t of oil, of which 60% was exported. The roadmap for production in 2020 is 10,000 t/year (MAPM, 2013). There have been attempts to grow argan in countries such as Tunisia, Spain and Israel. Argan propagates readily by seeds. It is a slow growing species that starts bearing fruits 5-8 years after planting. After prolonged drought, it shed its leaves and stays dormant for several years. Argan flowers in May-June and the fruit may require one year to ripen. Argan reaches its maximum production when it is 60 years old. The average fruit yield, which was about 8 kg/tree/year until the 1990s, has increased to 30 kg/tree/year in the 2000s (Lamnauer, 2005). Argan plays an important role against desertification in southern Morocco. Its large and dense crown protects the soil and pasture from sun damage and its deep root system binds the soil and helps water infiltration, which replenishes ground water (Orwa et al., 2009). Argan trees provide valuable shade for humans and animals. They are used to make barriers and windbreaks (Orwa et al., 2009). In Morocco, droughts in the early years of this century resulted in nomads moving their herds into the argan forest which soon became overgrazed. This phenomenon combined with overexploitation of argan for fuel, together with land clearance for agriculture, resulted in a decrease in tree density (from 100 to 30 trees/ha) and cultivation (loss of 600 ha/year over 17 years) and an overall reduction of the south-western argan forest (Alifriqui, 2004; DREF/SO, 2005 cited by Zugmeyer, 2006). 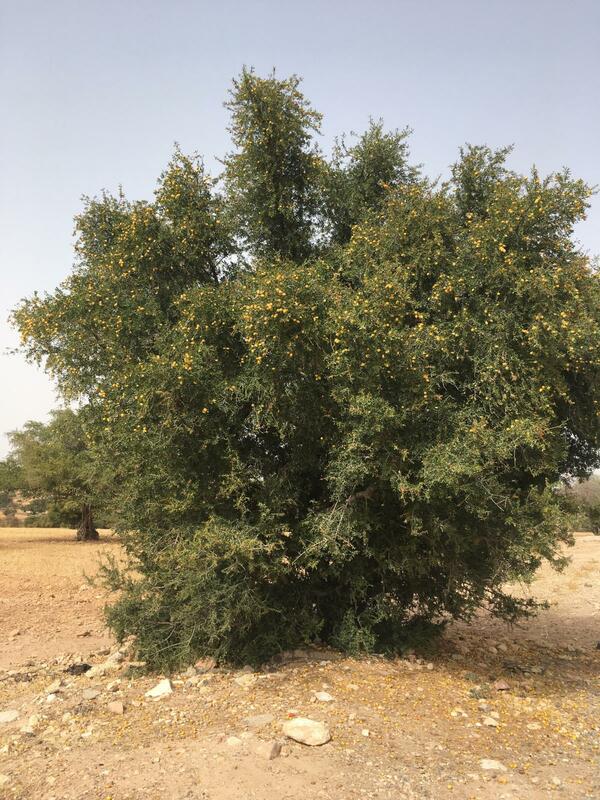 In rescue programmes, argan trees, other forage shrubs and pastures are planted together to allow both livestock grazing and argan tree regeneration (Zugmeyer, 2006). Argan leaves are moderately rich in protein (12-17% DM). At the time of writing, the only two fibre values available in the literature seem inconsistent with each other: crude fibre 6% (Merouane et al., 2014) and ADF 19% DM (Charrouf et al., 2009). Dried argan fruit pulp is poor in protein (5-10% DM) but relatively rich in oil (4-9% DM). Fibre values are extremely variable (ADF from 7 to 35% DM). It is rich in non-structural carbohydrates, but data are lacking. An early study reported that the pulp was particularly rich in soluble carbohydrates, particularly when mature (Sandret, 1956). Argan oil meal is a protein-rich feed with an extremely large compositional range according to the few data available. Protein content varies from 33% (in mechanically extracted meals) to more than 50% DM (for solvent-extracted meal). Press cakes are rich in residual oil, from 7 to 25% DM, and also in fibre (ADF 10-21% DM). The greyish-green oil cake contains high amounts of saponins, which do not harm ruminants and pass out with the urine. Early reports mention that the milk from livestock fed argan oil cake contains saponins, which may cause diarrhoea in children, but this has not been confirmed by later reports (Göhl, 1982). In spite of their importance in local economies, nutritional information about argan foliage and argan by-products is almost non-existent. At the time of writing (February 2015), these products have not been tested in in vivo trials. 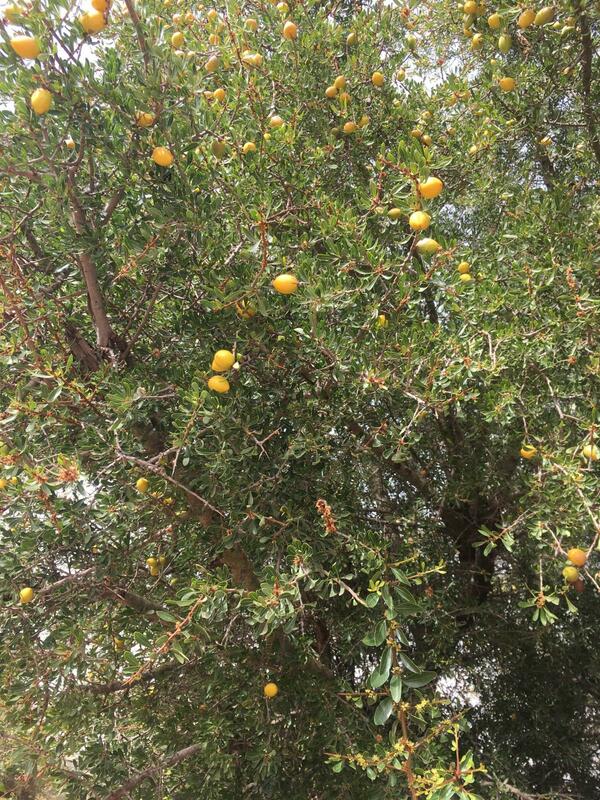 In Morocco, argan leaves and fruits are regarded as a valuable feed for ruminants (Göhl, 1982). In the argan forest area, sheep, and more particularly goats, rely on argan trees for their daily diet. 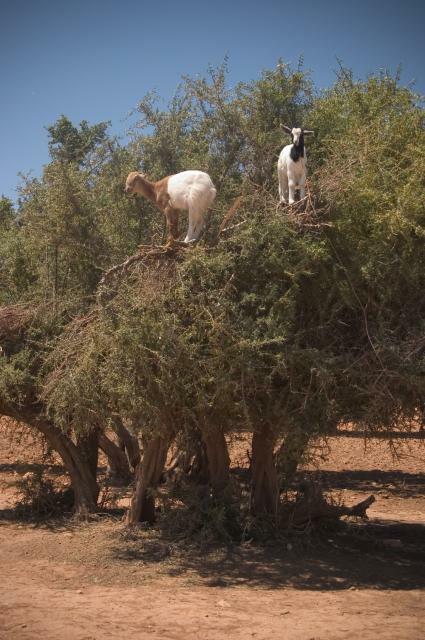 The argan tree forest was reported to hold between 26 and 30% of Morocco's goat population in 2005 (Jaouen, 2005). Argan forage has been reported to account for 48-95% of goat diets (El-Aich et al., 2007; Zugmeyer, 2006). 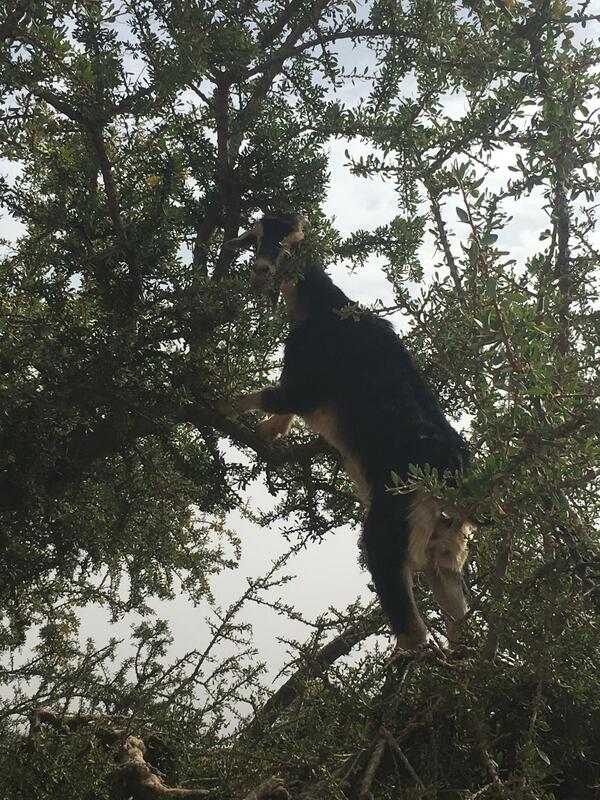 Local Moroccan goats use Argan tree woodlands with a large flexibility and adaptation capacity to meet their dietary needs, and often climb or reach up the trees to graze (they are particularly fond of aerial grazing) (El-Aich et al., 2007). The meat of kids browsing on argan trees was reported to be tasty and of high nutritional quality (Bas et al., 2005). It was suggested that goats were the only ruminants able to produce meat on a diet of argan (El-Aich et al., 2007). In the absence of formal nutritional evaluation, this indicates that argan leaves and fruits have a reasonable feeding value for meat production in small ruminants. The OM of argan leaves was reported to be fermentable in the rumen (Merouane et al., 2014). 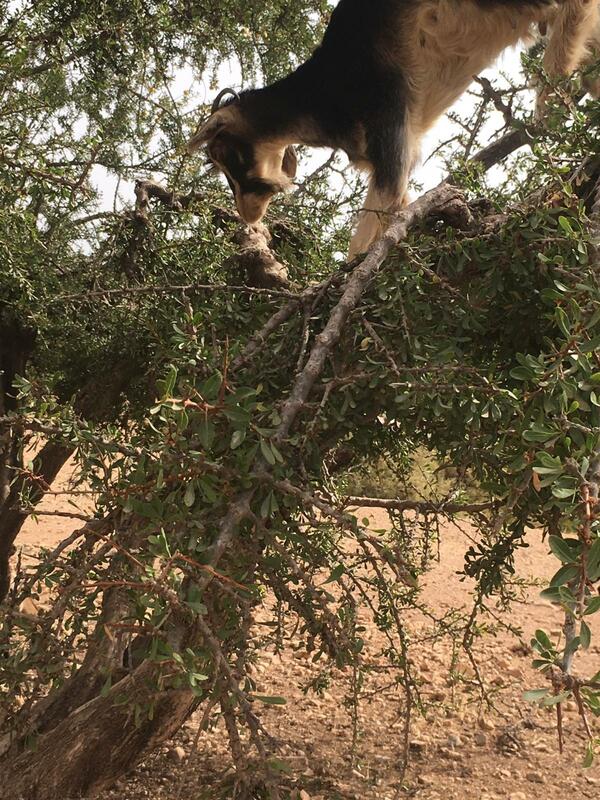 During the dry period, the only feed available for goats is from the argan trees, resulting in a reduced intake and a poor condition of the animals. 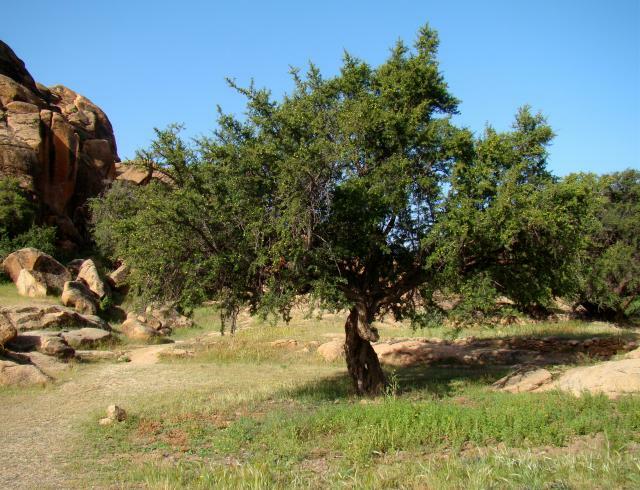 The rate of overgrazing was estimated to be as high as 88%, which also stunts development of the argan trees. After several years of drought in the argan tree forest, sheep rearing has been developed at the expense of goats because sheep eat less argan forage (reported to be only 17% of their diet) and are consequently less detrimental to the forest (Zugmeyer, 2006). Argan fruit pulp (alig) has been traditionally fed to livestock in Morocco. The dried fruit pulp is relished by ruminants and camelids. An early study (based only on the chemical composition) estimated that its nutritive value was 70-100% that of barley (Sandret, 1956). Argan pulp was reported to meet about 50% of the nutritional requirements of goats (Boscher, 1992). The OM of the fruit pulp was reported to be readily fermentable (Merouane et al., 2014). Argan fruit pulp is sensitive to the Mediterranean fly Ceratitis capitata which can dramatically reduce its nutritive value (Orwa et al., 2009). Some attempts have been made in the 2000s to improve the argan value chain, by extracting some valuable components from the pulp while making protein and sugars still available for livestock feeding (Pioch et al., 2011). Argan oil meal is rich in oil and is thus a source of energy for livestock (Charrouf, 1999). Cattle readily consume argan oil cake in spite of the presence of saponins that may have antinutritional effects. Up to 2 kg/d can be fed to beef cattle without harm (Göhl, 1982). A silage made of culled opuntia mixed with argan oil meal and fed to sheep resulted in lower growth performance than a commercial concentrate but it reduced feed cost (Bendaou, 2013). Boscher, C., 1992. 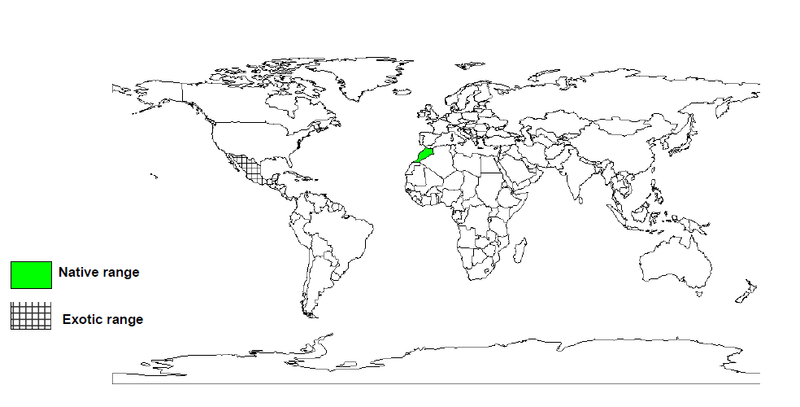 Fragilité et résilience du système agraire de l'arganeraie des Ait Baha vis-à-vis des aléas climatiques. In: Mémoire Ecole Superieure d’Agron. Tropic., Montpellier, 94 p.
Zugmeyer, L., 2006. Projet de développement sylvo pastoral de l’arganeraie marocaine (commune rurale de Tiout, Taroudant, Maroc). In: MSc Thesis. Mémoire de fin d’études, ENGREF Nancy, 86 p.